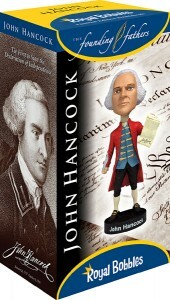 John Hancock was a merchant, statesman, and prominent Patriot of the American Revolution. He served as president of the Second Continental Congress and was the first governor of the Commonwealth of Massachusetts. He is remembered for his large and stylish signature on the United States Declaration of Independence, so much so that “John Hancock” became, in the United States, a synonym for “signature”. Hancock was one of Boston’s leaders during the crisis that led to the outbreak of the American Revolutionary War in 1775. He served more than two years in the Continental Congress in Philadelphia, and as president of Congress was the first to sign the Declaration of Independence.